For Denver's current NFL stadium, see Sports Authority Field at Mile High. Mile High Stadium (originally Bears Stadium) was an outdoor multi-purpose stadium in the western United States, located in Denver, Colorado. A large bleacher section was added along the south side and temporary east stands were built in 1960, raising the capacity to 34,000. Denver had to settle for the minor league Bears and the AFL Broncos, who resembled football's version of the early New York Mets. The players looked comical in their yellow and brown vertical striped socks and mustard yellow and brown uniforms, and the team was sometimes derided by local fans in the stadium when the Broncos would take the field. It took a few years to gain a following. In 1961, they drew fewer fans in a year than the Broncos now draw in a single game. In the middle of the 1960s, the team changed its colors to orange and blue, became slightly more competitive, attendance turned around and more locals caught what came to be known as "Bronco Fever". One condition of including Denver in the AFL-NFL merger announced in 1966 was expanding Bears Stadium to at least 50,000 seats. This required adding second and third decks along the west sideline (first base line). This expansion was completed in 1968, when the stadium was sold to the city of Denver, which renamed it Mile High Stadium and built the upper deck along the west side, thus raising capacity to 50,657. Metallica and Guns N' Roses brought the Guns N' Roses/Metallica Stadium Tour to the stadium on September 19, 1992, with Body Count as their opening act. Lynyrd Skynyrd played at the Stadium June 27, 1976, as part of their One More From The Road tour. On 21 October 1992, U2 performed at Mile High as part of the third leg of their Zoo TV Tour. U2 would return again to perform in concert 1 May 1997 on the first leg of their PopMart Tour. June 27, 28, and 29, 1969, concert promoter Barry Fey held The Denver Pop Festival at Mile High Stadium with many well known acts performing every evening. The city of Denver supported the festival and made available areas for camping and other services. The Denver Police however allowed non-ticket holders to enter the parking area whereupon they attempted to climb over chain link fencing to see the show while claiming that music should be "free". Police responded by lobbing tear gas canisters toward the fences knowing full well that the gas would affect everyone in attendance at the outdoor venue. Sunday night's final act was The Jimi Hendrix Experience which proved to be the Experience' final performance as a trio as well. Bassist Noel Redding quit and simply flew back to England that night. Jimi did not perform again for 6 weeks until mid August when he closed The Woodstock Music and Art Fair with his new band. Jimi Hendrix died 13 months later in September 1970. 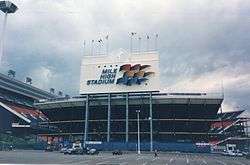 The stadium again hosted Ozzfest, for the second and last time, on June 21, 2001 and hosted The Area:One Festival on July 28, 2001. The stadium was featured in Michael Moore's 2002 documentary Bowling for Columbine as the backdrop for Moore's interview with controversial rock musician Marilyn Manson during the 2001 Ozzfest tour. 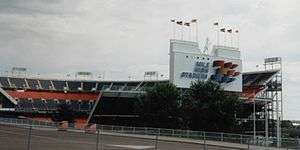 Mile High Stadium was closed in 2001, after the Colorado Rapids and Denver Broncos moved to neighboring Sports Authority Field at Mile High (then known as Invesco Field at Mile High), upon completion of the new stadium. The demolition of Mile High Stadium began in January 2002, an event covered extensively by local newspapers and broadcast live on television. The demolition was performed by Spirtas Wrecking Company of St. Louis, Mo., the same group that led the demolition of arenas and stadiums in St. Louis, Pittsburgh and Seattle. The stadium demolition was completed by April. The former stadium is now a parking lot for Sports Authority Field at Mile High. The historical site of many games and events for 40 years is marked by the hills forming the west and north stands, the corner between them descended by a staircase, much as the stands were. The location of home plate is identified by a marker located at 39°44′47″N 105°01′19″W﻿ / ﻿39.74637°N 105.02187°W﻿ / 39.74637; -105.02187﻿ (Mile High Stadium home plate marker). 1 2 3 "Mile High Stadium". Project Ball Parks. 2010. ↑ "Stanley E. Morse architectural records, 1924-2008-Denver Public Library". ARCHIVEGRID. OCLC Online Computer Library Center, Inc. 2008. Retrieved 26 April 2015. ↑ "History of GH Phipps". GH Phipps Construction Company. 2015. Retrieved 29 April 2015. 1 2 3 4 Lynch, R.G. (October 16, 1949). "Denver shows way to get Milwaukee ball park". Milwaukee Journal. p. 3, sports. 1 2 "Mile High Stadium". Ballparks of Baseball. Retrieved 29 April 2015. ↑ Shrout, Brian (8 June 2012). "Little Known Broncos Facts: We Have a General Manager?". SB Nation – Mile High Report. Retrieved 29 April 2015. Saban was a driving force behind a fund raising campaign which allowed the city of Denver to purchase the stadium and expand its seating to 50,657. The stadium was subsequently renamed "Mile High Stadium." 1 2 Moss, Irv (August 17, 2010). "Jim Tolle, Mile High Stadium stands engineer". Denver Post. Retrieved October 31, 2012. ↑ Axver, Andre; Muehlbradt, Matthias. "U2 Denver, 1992-10-21, Mile High Stadium, ZOO TV Tour - U2 on tour". U2gigs.com. Retrieved 22 January 2016. ↑ Axver, Andre; Muehlbradt, Matthias. "U2 Denver, 1997-05-01, Mile High Stadium, PopMart Tour - U2 on tour". U2gigs.com. Retrieved 22 January 2016. ↑ "Apostolic Journey to Jamaica, Mexico and Denver (Colorado) (August 8–16, 1993)". John Paul II: Travels. The Vatican. ↑ "The 1993 Colorado Rockies Regular Season Game Log". Retrosheet. ↑ "The 1994 Colorado Rockies Regular Season Game Log". Retrosheet. ↑ "Mile High Stadium Memories". Denver Broncos – Traditions. Retrieved 29 April 2015. ↑ "Marilyn Manson Interview on Bowling for Columbine". Bowling for Columbine. October 11, 2002. Retrieved 2010-11-15. ↑ "Bears Stadium - Denver, CO - Colorado Historical Markers on Waymarking.com". Waymarking.com. Retrieved 29 April 2015.